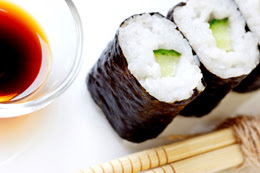 ARF / 5-A-Day: Sushi Cravings! | What Smells So Good? Wow... another week's flown right by! Only last week I was prepping to go out to lunch with some bakery clients, and now... well, I'm prepping to go out to lunch with a bunch of my bakery clients and fr iends while hocking my wares at my mom's office! The only difference is that there is now only 14 days to go until Christmas morning (where the heck did that time go?). The place we're heading is wonderful, albeit tiny, and has the freshest sushi of anywhere in Toronto I've had (Gonoe Sushi's the name of the place). I always get the same things when I go for sushi, and without a doubt theyre my faves: Tekka Maki (tuna roll), Kappa Maki (cucumber roll) and salad. I always gorge myself on the pickled ginger too (both mine and Andrew's, if he's with me haha). Those Japanese are definitely up to a lot of good with their ginger addition to cuisine, and especially my cuisine, since some days I feel so ill that all I crave is a plate of pickled ginger! Pickled ginger (AKA gari) is usually served as a palate cleanser with sushi. 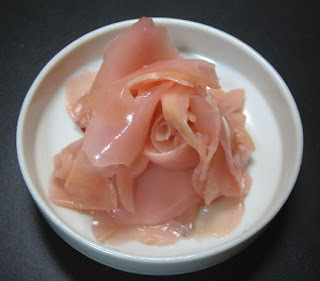 Gari made from young ginger roots has a pinkish color to it, which results from the vinegar soak. Older, white ginger is fine to use too (it's pretty much all I can find short of heading out to the Asian market), but be warned... it is spicy! There are a host of benefits to eating ginger, aside from the fact it tastes good, and they make it a great inclusion in Sweetnick's ARF / 5-A-Day event. For example, it works wonderfully as a nausea suppressant, and is one of the top antioxidant suppliers in any food group. Compounds in ginger have anti-inflammatory properties and are also known t o have a stimulating effect on the muscles in the digestive tract. With a very sharp knife (or a mandoline slicer if you have one) slice the ginger thinly and salt the pieces. Leave one hour in a cool place. Rinse and dry the ginger and put into a large jar. Mix rice vinegar and sugar in a pan, bring to a boil. Boil 2 minutes, then pour over ginger slices. Cover the jar and store it in the refrigerator at least 5 days before use. 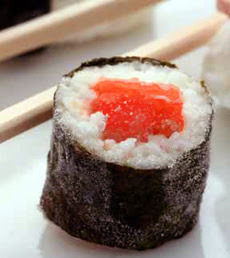 I love, love, love sushi! I never would have thought to make pickled ginger at home though. Great post! Just so beautifully colorful and fresh, Sarah! i've never seen a recipe for this before - it's another excuse for me to talk my husband into letting me get a mandoline! great post!